[26-Feb-16] Frontal zones and microscale oceanographic features are easily observable from satellite measurements of SST and Chl a. Enhancing the utility of these space borne measurements for biological productivity, biogeochemical cycling and fisheries studies, will require novel bio-optical methods capable of providing information on the community structure, biomass and photo-physiology of phytoplankton, especially in regions where these smaller but prominent oceanographic features exist. 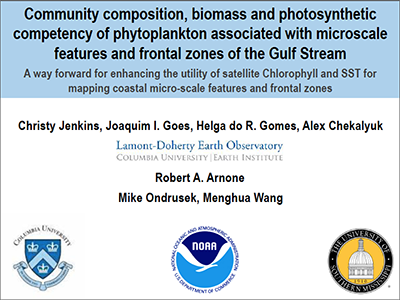 During a recent NOAA sponsored research cruise in Nov. 2014 planned to validate products from the ocean color satellite VIIRS, we were able to obtain high-resolution in-situ measurements of sea water hydrography (SeaBird CTD®), CDOM (WetLabs ALF®), phytoplankton functional types (PFTs, FlowCam®), biomass (bbe Moldaenke AlgaeOnlineAnalyzer® and WetLabs ALF®) and phytoplankton photosynthetic competency (Satlantic FIRe®) across these microscale features. When mapped against binned daily, Level 2 satellite images of Chl a, Kd490 and SST over the cruise period, these in-situ data showed great correspondence with the satellite data, but more importantly allowed for identification of PFTs and water types associated with microscale features. Large assemblages of phytoplankton communities comprising of diatoms and diatom-diazotroph associations (DDAs), were found in mesohaline frontal zones. Despite their high biomass, these populations were characterized by low photosynthetic competency, indicative of a bloom at the end of its active growth possibly due to nitrogen depletion in the water. Other prominent PFTs such as Trichodesmium spp., Synechococcus spp. and Cryptophytes, were also associated with specific water masses offering the potential that ocean remote sensing reflectance bands when examined in the context of water types also measurable from space, could greatly enhance the potential of satellite measurements for ecological, productivity, biogeochemical cycling and fisheries studies. Credit: Jenkins, C.A., Goes, J.I., Gomes, H.R., Chekalyuk, A.M., Arnone, R., and Tufillaro, N.B..